ErtelAlsop industrial mixers feature a modular designed agitator based on over 80 years experience in liquid blending and processing. Hy-Speed® mixers are used in the Pharmaceutical, Chemical , Cosmetic , and Food & Beverage markets for continuous or batch operations. Our exclusive construction allows the interchange of components such as electric and air driven motors, gear trains, mounting brackets, saddle plates, shafts and propellers. 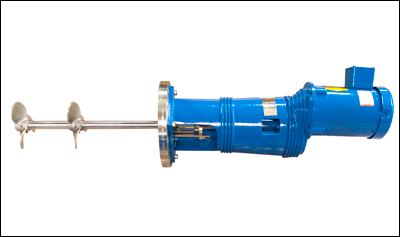 It provides our users with an almost infinite choice of final design to match the mixer to the application at the lowest possible cost. Our industrial mixers are available in sizes ranging from ¼ to 3 horsepower and meet requirements for blending light liquids below 500 CPS as well as viscous fluids up to 10,000 CPS Many powders, pulps and fibrous materials can also be blended economically with ErtelAlsop modular industrial mixers. Our Hy-Speed® mixers can be added to an existing system or supplied as a Combination Processing Unit (CPU). The CPU is a portable processing plant and can include a batch tank, mixer, pump and filter. You can agitate your liquid and allow for filtration/separation of liquids after blending compounds. Various models of filters, agitators and tanks are available for your specific application.